Creatine has maintained it's reputation as possibly the most effective supplement ever. Creapure Creatine has always been the benchmark by which Creatine quality is compared. 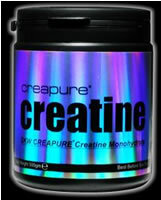 Reflex Nutrition has bought this creatine to you at a much reduced price. Creapure Creatine is used by all the leading supplement companies, Prolab, Chemical Nutrition and all other quality suppliers. No matter what brand is on the label, if it says Creapure Creatine on the outside, the contents are identical. This Creatine package from Reflex represents top value for money. Reflex Nutrition is a name synonymous with quality, performance and reputation, which is why we work with the best manufacturers of Creatine in the world - Degussa BioActives in Germany. Creapure creatine is available in two sizes, either 250 grams or 500 grams. You can buy cheaper creatine, but if it has not got the Creapure logo then there is no guarantee that it is free from impurities. The CREAPURE logo is your guarantee of quality. CREAPURE products are HPLC tested for purity, but perhaps more importantly are guaranteed* free from impurities and by-products, creatinine (CRN), dicyandiamide (DCD) and dihydrotriazine (DHT). *according to present analytical methods. 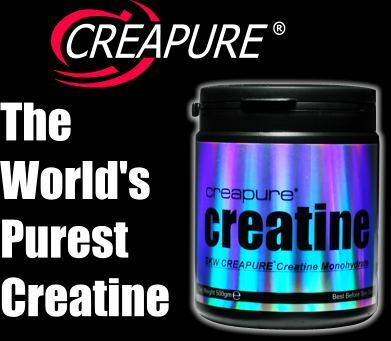 In fact, on the market today the only creatine product that has tested consistently the best is CREAPURE Creatine Monohydrate from Degussa BioActives in Germany.